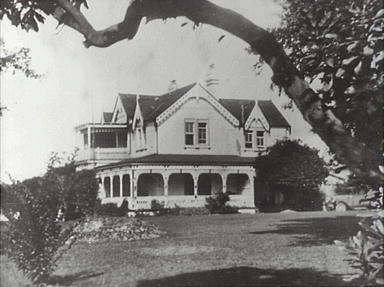 The Arnott family were the owners of the cottage Homedale (demolished in 1975) from 1911 until Foster Hartley Sargent purchased the property in 1913. The Hoare family had been the original owners of the estate until it was acquired by solicitor John Williamson c1910. Williamson did not hold the property for long because shortly after the purchase the Blue Mountains Echo announced that Mrs Hoare’s property had changed hands, and the estate was now to be subdivided. This perhaps was the sole purpose of Williamson’s procurement of the land. It appears that the Arnott family acquired lot 1 (3a.2r 29p) from the sub-division, which was located on the corner of what became Homedale Street and Railway Parade. The lot also included the cottage Homedale, and Halse Rogers Arnott was named as the owner on the title deeds. Halse, a biscuit manufacturer, was born in 1879 to William and Margaret Arnott. He was one of several children from the second marriage of his father to Margaret McLean Fleming. The names of his siblings were: William born 1866, Janet D. 1867, John M. 1869, Arthur Smith 1870, Margaret F. 1872, Robert Fleming 1873 and Johanna F. 1877. William - Halse’s father – founded Arnott’s Biscuit Company. William Arnott, born in 1827, was one of several children that eventuated from the marriage of William and Isabella Arnot. He sailed to Australia in 1847 from his homeland Scotland, accompanied by his brother David. On the voyage to Australia William met his first wife, Monica Sinclair. Following their marriage he added the second‘t’ to his name, and Monica went on to bear him several children before dying fifteen years later. In debt for £132, William moved his family from Maitland to Newcastle c1864 (this may not have been the case -see below) It was here that he met Margaret McLean Fleming, and in 1865, married for a second time. William’s hard work paid dividends and in c1877, he opened his first biscuit factory in Newcastle. The business expanded and the family never looked back. In 1888, Arnott’s became a registered trademark. William Arnott died in 1901, at the age of 74. Sons Leslie and Samuel (from his first marriage) who had been trained as his successors became chairmen and directors of the business. 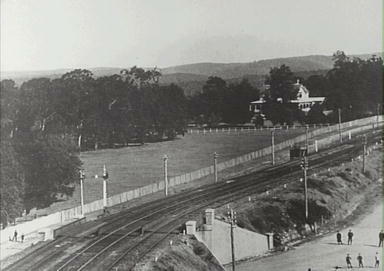 In 1906, the Arnott brothers purchased just over six acres of land at Homebush. This enabled the firm to build a large new Arnott’s biscuit factory that allowed the business to further expand and keep up with the growing demand for their products. The factory was erected in two years and was said to have contained the most up-to-date equipment in the world at that time. Leslie and Samuel were succeeded by their half brothers William John McLean and Halse Rogers Arnott. Robert Fleming Arnott became an engineer and Arthur Smith Arnott was a colonel in the Salvation Army. In 1910, Halse was a member of the Springwood Progress and Ratepayers Association, and a one-time Secretary of the School of Arts. It appears that even though the cottage Homedale had been sold, the Arnott family still retained ties with the Blue Mountains, as their names appeared periodically in various local newspapers. Herbert L., the son of James and Bessie (nee Webb) Arnott married Ethel H. Walker in Springwood in 1898. Solicitors A. J. Taylor and William Arnott had rooms in Sydney and visited clients at The Ferns each week. William Arnott married Elizabeth A. Berry in 1889. It is assumed that William Arnott, the solicitor, was related to the Arnott family referred to here. The name Arnott derives from the twelfth century Michael de Arnoth. He was in possession of lands in Fife, which is where the Australian Arnott family originated from. The name became extinct when the sixth baronet died without heirs, but was revived when a relative succeeded to the estate through his mother and assumed the name Arnott of Bolcormo. He was a well-known lawyer, historian and antiquarian and published works on celebrated criminal trials in Scotland. Arnott’s had its origins in West Maitland when William Arnott, a baker and pastry cook, set up business in 1853. A series of floods caused him to move to Newcastle where he leased property in Hunter Street and began baking bread, pies and biscuits. The company went from strength to strength and by 1880s, the firm was producing and distributing 80 different varieties of biscuits. The firm employed over 800 people in 1901, the year that William Arnott died and 1800 people in 1929. Halse Rogers Arnott, his youngest son, qualified at the University of Sydney in 1925, receiving the Degree of Bachelor of Medicine and Master of Surgery. He was created a partner in the Arnott’s business in 1902 and remained Chairman of the Board until 1961. In the 1930s Halse designed a house located in Burns Road, Wahroonga. At one time he owned Bulwarra located at Hunters Hill, which was purchased by the actress Cate Blanchett in 2008. The University of Sydney, Alumni. Sydney Morning Herald, House of the Week, 1.8.2009. Newcastle Regional Museum, Arnott Partnership Agreement, 1904.